Before Jaxzen was born I made a list in my head about what is important when choosing her clothing. Having a baby reprogrammed my way of thinking on everything, especially the environment and supporting other people's dreams. I've been very picky with what mattered most when it came to dressing her. The brands that I have chosen to feature encapsulate all the features that matter most (to me)! Comfort #1 : Skinny jeans might sound cute on a baby because "omg that baby is wearing jeans", however, in my opinion it was the worst idea ever... Do you like wearing skinny jeans for comfort? To run around and play? To sit in the car? I am going to assume you don't reach for denim when doing strenuous activity, or looking for comfort. Personally, I do not know why we would ever put a baby in something so restricting (I've done the work so you don't have to, but trying to put on baby jeans is harder than trying to squeeze in to your own jeans after the holidays). Jaxzen has never worn jeans, and since she was born, I do not think I've attempted to wear jeans, either. Comfort is the most important aspect because babies are always on the move. Support Small Shops: This goes without needing too much explanation. When you buy small, you are supporting someone's dream. That is so important. I mean, I love a good Walmart deal, or a Costco sleeper for $7.99, but I do my absolute best to support small shops whenever possible. Some may argue that the prices are higher than Carter's, Walmart or other big box brands, however, the quality and customer service are next to none. Not only are they extremely well made, most focus on sustainability, eco-friendly materials, and, are typically made in Canada or local to the small shop. On top of everything, the relationship you build with small shop makers and owners is priceless. Eco-Friendly: Babies can make quite the impact on the environment, humans in general are bad for that, obviously. However, sustainable resources, pesticide free clothing, less waste and less "fast fashion" are extremely important when buying for my baby. We will probably have another child and being able to reuse items is the goal, lots of small shops offer gender neutral products and long lasting quality. Nothing Cutesy or Flashy: This one is tough. For some reason many big brands believe babies can read. Pretty Like Mommy - Uhm, sorry, but can she be smart like mommy? A boss like mommy? Lots of bigger brands have clear cut gender specific shades and designs, some stores look as if a wall was built to completely separate boy from girl... You get the point. I do love a silly Mom & Me set, for example: Sorry we are late (Mom) & I'm the reason we are late (baby), or an adventure theme quote. Those can be super sweet and witty, however, for the most part I like to keep things fashion forward for my Little. 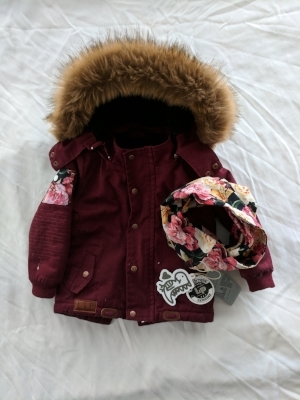 Patterns are always great, florals are amazing and plaid (if tastefully done) is awesome, but I refuse to put my child in something that I wouldn't wear. A Cozy Collection - For all your knitting needs this wonderful maker has styles for days. I have been wearing A Cozy Collection for years and I am extremely happy that Jaxzen gets to rep for this small shop. Not only is the Maker of A Cozy Collection one of my best friends, her talent is undeniable. She can create her own patterns, put a twist on other patterns and make just about anything you want with a ball of yarn. Give her some love on Instagram @acozycollection . I guarantee warmth and love go into every piece. I wonder what's in store(s) for 2018!